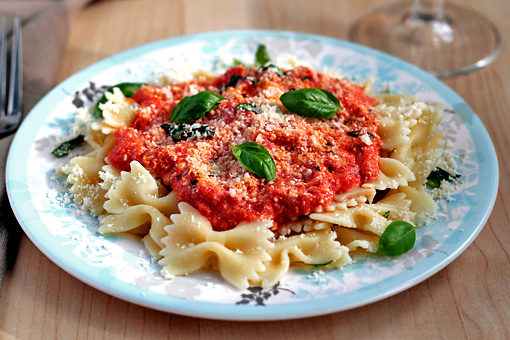 Farfalle pasta is the best! This kind of pasta has grown closest to my heart. For some reason it even tastes better than the other kinds. This time I’ve decided to prepare these lovely little bow-ties with a very simple tomato sauce. 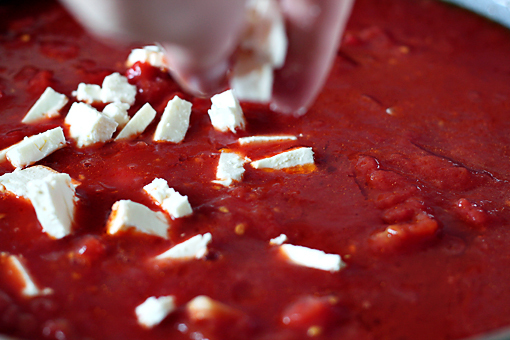 But there’s this thing I need to own up… I saw Feta cheese in the fridge and just couldn’t resist and had to add it to the sauce. The temptation was too strong. Stronger than me. The cheese has given a unique tang to the sauce and it was all perfectly yummilicious! 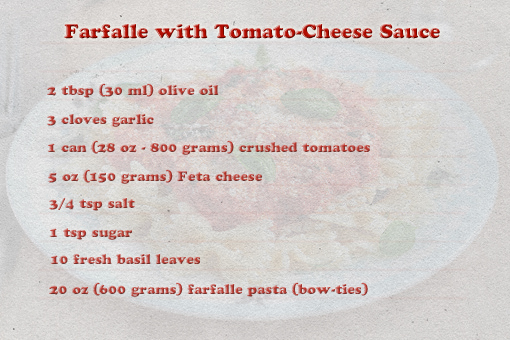 These are the ingredients that you need if you want to make your own Tomato-Feta Farfalle. 1. 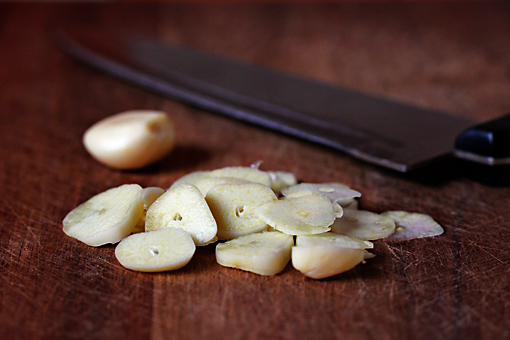 First, peel and slice the garlic thinly. 2. Then pour the olive oil into a pan and heat it up. 3. 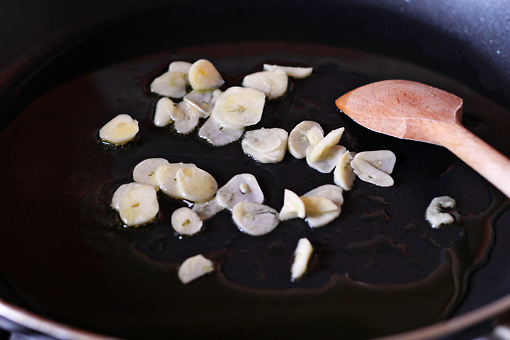 When the oil begins to sizzle add the garlic. Cook for about 1 minute stirring constantly. 4. 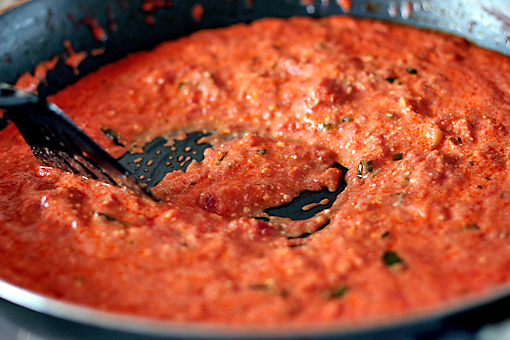 Add the crushed tomatoes, salt and sugar and stir again. 6. …and add it to the sauce. 7. Stir it all and let cook over medium-low heat for about 20 minutes. Stir every two minutes or so. I wonder, will I ever tire of this color? 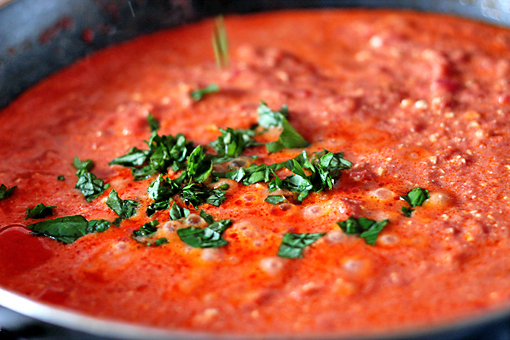 The color of tomato sauce might actually be the reason why I fell in love with food photography. 9. 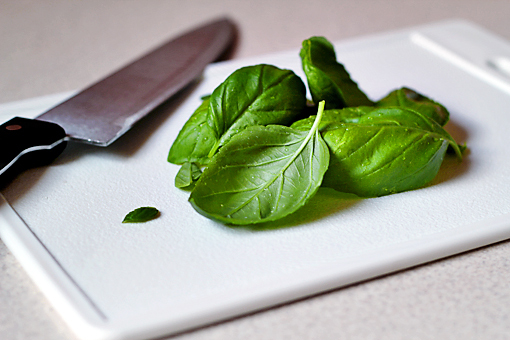 …and add them to the sauce about 18 minutes into the cooking process so that the basil can cook with the sauce for about two minutes. 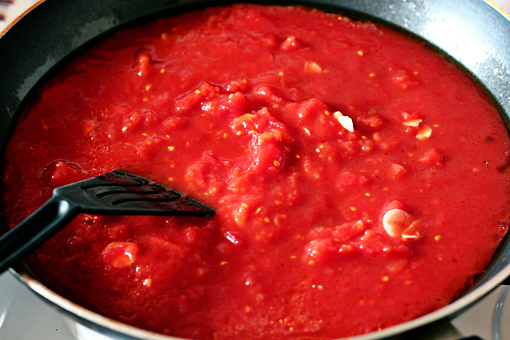 You’ll notice that the sauce has reduced in volume a little and has become more thick. 10. Cook the bow-ties according to the package instructions. You can even sprinkle a little Parmesan on top. That will transfer you to heaven instantly. 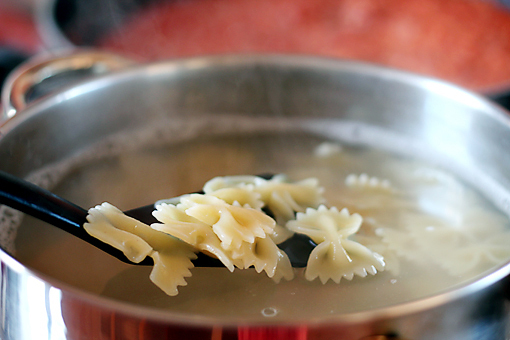 My 4 year old son always asks if we’re having “the bow one’s” (Farfalle) whenever I’m cooking up pasta, he’s a big fan of Farfalle pasta too! We had Farfalle pasta tonight. You are right they are the best. That bow-tie pasta recipe was fantastic! Thanks so much. I made it for my husband and he really enjoyed it. 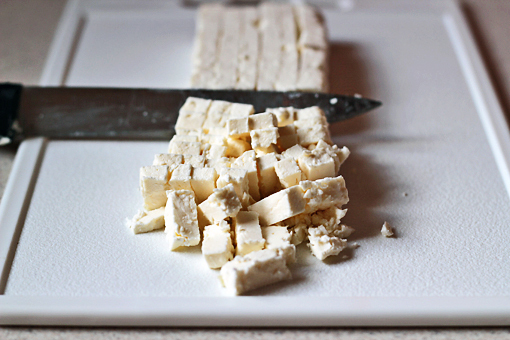 what cheese could substitute the feta? would onions ad anything or detract? looks good! I’m kicking myself because I just found out how great feta cheese is with pasta! Had absolutely no idea what I was missing! Hi Petra! 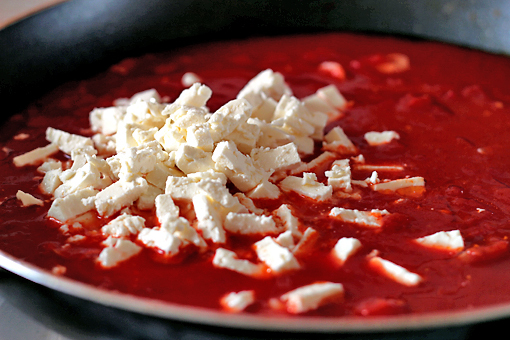 Would you recommend ricotta or cottage cheese as a replacement for feta? Or even cream cheese? I know it’s such a small amount, but I really don’t like feta LOL! Instead of feta, try gorgonzola….enjoy!